Alistair Leak in the new Bulldogs home shirt. 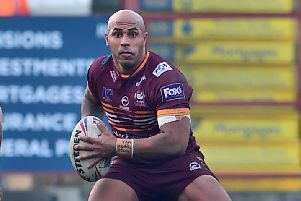 Batley Bulldogs are hoping to give away 1,000 junior season tickets to children in the local area as they look to build the club’s fan base. Batley, along with a number of other Championship clubs, have offered free or vastly reduced junior season tickets for a number of years but they are looking to extend that scheme for the 2019 season, thanks to a sponsorship deal with local burger restaurant Frankie’s. It is an ambitious scheme by the Bulldogs but one they hope will increase matchday attendances at Fox’s Biscuits Stadium. Batley chairman Kevin Nicholas, who is embarking in his 21st year at the helm of the Bulldogs, also revealed season ticket prices for adults and concessions, offering fans up to £6 discount per match. An adult season ticket for 2019 will cost £185 for 13 home Championship fixtures, plus the chance to buy a half price Summer Bash ticket to see Batley take on Dewsbury Rams. This equates to just over £14 per match, offering huge discounts on matchday prices. Concession season tickets will be priced £135, which is just over £10 per game. Mr Nicholas said: “Our season tickets are being sponsored by Frankie’s Restaurant and because of that we are still able to give the kids season tickets away for free. “Our target this year is to give away 1,000 kids season tickets. Batley are also introducing a scanning system when a credit card style ticket, will allow season pass holders access on matchdays. Advanced cash matchday cash tickets will also be available at the Bulldogs breakfast club each Tuesday priced £18 or £13. The Bulldogs also revealed their smart new playing strips for the 2019 campaign at last Friday’s supporters get together. The new home and away shirts, along with a range of Bulldogs clothing, are available from local firm Ravensport.